I'm pleased to announce a PvP tournament that will consist of 5 everyone-against-everyone-battles. All participants will receive a set of equipment just before each battle to make it fair and free. Your total kills is your score, simple. How many of the 5 battles each player wants to participate in, is up to them. However, there is definitely a competitive advantage in participating in all 5 battles to get some kills! No sign up required! You get one life per battle. If you die, you are out of the battle. Kills are not lost when dying. All prices is sponsored by Tornadicmaniac. Gear sets, arena location, and time will be announced later. Will you participate in the Arcane Proving Grounds? Will this take advantage of the tube/subway system to get to the arenas? it will show veterans all the new locations accessible by transit. I volunteer Oracle arena for one of the locations, if you're still undecided. Is it allowed to team up against your "friend" and to burn its remains with lava - all under the condition that your "friend" wears a haptic suit? If yes, please consider counting me in. Spoiler tags added by Tee. This isn't the thread for this discussion. Please create your own thread if you still feel aggrieved. 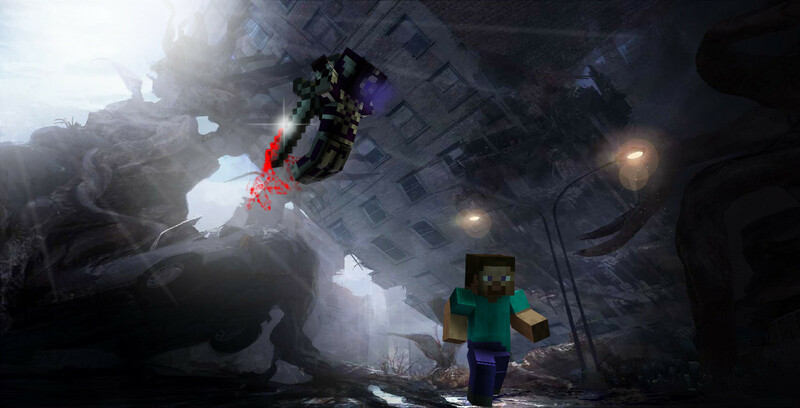 Just before each battle, all participants are guided from spawn to the arena, via the most convenient route. Short answer: Perhaps. If we pick areas of interest, how could we not pick the Oracle Arena? I mean, come on, of course, we will have a showdown there. 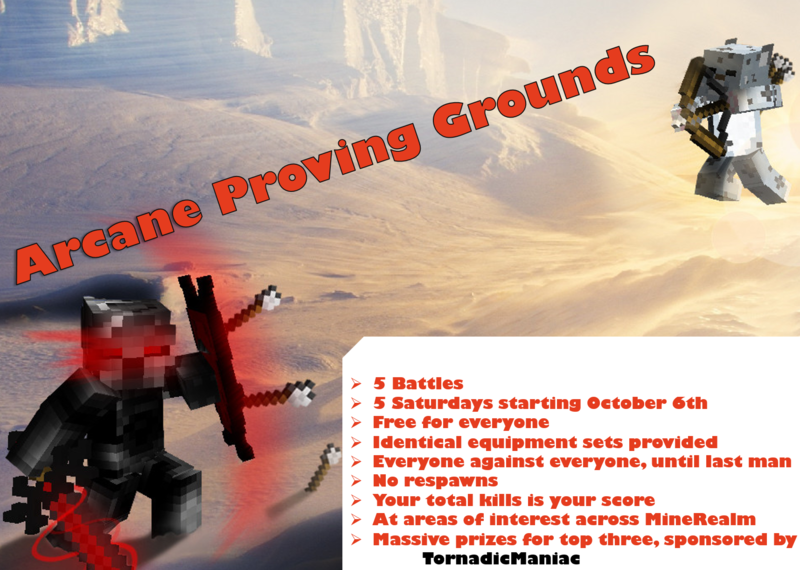 The event and its prizes are sponsored by TornadicManiac. To my knowledge, this is the biggest prize a PvP event has ever gotten on MineRealm. I do not question the blue-haired monster's morals nor where those credits came from. In short, we discourage teaming up. However, you are allowed to team up with buddies, but if this is abused (free kills), the overseer will not hesitate to penalize by subtracting that kill. All gear/items are given, you are not allowed to bring your own mojo. The format is the most flexible regarding the number of participants, it's easy to manage regardless of there are 5 or 40 players. Some people might have other important real-life matters, this gives them multiple chances to take part in the fun. It gives the sponsor most bang for the buck, and not just 5 minutes of fun. So that all players have equal chances. So that it is Free. So that we can balance the gear/items to make the battles last longer and be more interesting. It takes 1:30 to take the subway to the oracle arena which is the first stop at Bahnchefs old pumpkin farm and 25 seconds to reach the arena by tube transit. Firstly, we should have pvp in the tube. D's team did such a great job, that schould be appreciated (honestly). Want to learn more about this great project! ... I do not question the blue-haired monster's morals nor where those credits came from. Neither did I. But not because I do not care about ethics, but because I just think that someone who should compensate for its wilful misbehavior should not act as sponsor. That's just misplaced and pretty low. Btw, if you ask me, the source is probably child labor and/or mining of plutonium ore.
(5 minutes later, thinking again about it and feeling some nasty pain in my stomage) What is wrong with you Red that you do not understand it? Killing me on my plot with lava while I was carrying 2 stacks of dia blocks is one thing (and only few people without plot rights can do so), but banning for absolutely no reason is something that is a no-go. My opinion. And now back to playing superman with your "friend". The first battle will be this Saturday 22:00 (10:00PM) UTC. You have to check what that time corresponds to within your own time zone. Eah showed me this website that is really convenient for doing this time zone conversion. If you have any issues with this, contact an adult or ask here. The first battle will be in/on Grelmans Oracle Arena. We meet up at spawn and march to the arena. The participants are not allowed to leave the red border as marked on the picture. The way to the arena from spawn, is marked with green. You are not allowed to place/remove blocks (some might be a plot member). You are allowed to be everywhere within the arena/halls/roofs, any y level, as long as you do not exceed the border. Should the battle drag out, the curators (TornadicManiac/Nephalem/Eah) will notify all participants to go to the center of the arena. You are encouraged to go check the beautiful arena out, but not allowed to change blocks there like make hidden pathways/traps/ect. Niiiice. 5 AM PST is rough hehe. Just out of curiosity and so other people know as well. How are we making sure people have empty inventories? I pushed the time as late as I could for me to be awake (midnight at UTC +2) so that it is more convenient for those around the united lands of the free and brave. PST is the same as UTC - 8. So 22:00 UTC = 14:00 PST. I think you made the earth spin the wrong direction there, Superman. We could kill everyone at spawn first to empty inventories. However, we can manage with good sportsmanship and disqualify those who use illegal items. The equipment/item sets could occupy the entire inventory revealing the cheaters. equipment/items/food are given, bring a totally clean inventory.